TGC 2013 Contribution: Enviro-Stewards' Safe Water Project - Tavares Group Consulting Inc.
By: Nicola Lochead, Marketing Intern, Tavares Group Consulting Inc.
As a consulting firm that specializes in corporate social responsibility, Tavares Group Consulting Inc. strongly believes in contributing to the community, as an important aspect of sustainability. This year, Tavares Group elected to think globally, when deciding which initiative we would contribute to. In September, we contributed to the Enviro-Steward’s Safe Water Project, which operates in multiple locations in Africa. Our contribution, combined with money raised at their annual golf fundraiser was used to purchase a three-wheeled motorcycle for the Juba construction location, established in November 2012. 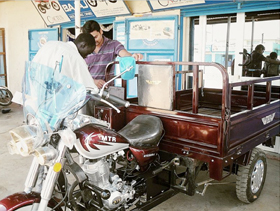 This motorcycle provides an essential means of transport, allowing the Juba location to distribute the BioSand filters they produce to surrounding areas. Enviro-Stewards has been implementing water purification systems in many areas of Africa since 2003. The BioSand filtration system allows water to be purified without the use of electricity. Not only is the BioSand filtration process cost effective, with systems coming in at $100, it is also more sustainable than traditional methods of water purification. The process is less expensive than traditional methods of water purification (burning charcoal or wood) financially and environmentally. The system can be assembled locally, and involves no chemicals or moving parts, and generally lasts for approximately 30 years. By contributing to an initiative such as the Safe Water Project, Tavares Group is demonstrating our commitment to be active stakeholders in the global community. The Project embodies the concepts of sustainability, from environment to community. By providing these communities with safe drinking water, the Safe Water Project is empowering residents, by improving access to safe drinking water, and reducing the risk on contracting water-borne diseases. The reduced time spent looking for safe water supplies allows many of the women and children to spend less time looking after basic needs. We feel as though this project is incredibly worthwhile and encourage others to look into ways that they can assist the Project in accomplishing its goals. To learn more about the Safe Water project, visit the Enviro-Stewards Website here.